These are exciting times on the tomato market. Many countries are currently in the transition period between the import and export seasons. In the meantime, the spread of the ToBRFV virus is being monitored worldwide. Various cases have already been reported in Europe and it is still unclear whether eradication of the virus is possible. The US Department of Commerce has announced a withdrawal from the Tomato Suspension Agreement. This could have major financial consequences for Mexican tomato growers. In the Netherlands, the traditional greenhouse vegetable season has started well. Crops grown under lighting and organic ones are expanding, putting prices under pressure. This applies in particular to on the vine tomatoes. These tomatoes were already in a difficult situation anyway last winter. The prices for the crops grown under lighting were "dramatically poor" in February, and it was important to get the winter production out of the way before the crops grown without lighting came on the market. For their part, growers of organic on the vine tomatoes hope that after two difficult years, this time they will have one with better prices. When it comes to good prices, growers of beef tomatoes take the cake. They are currently doing reasonably well, with good prices due to a high demand. The biggest concern for the growers, in addition to prices, is the ToBRFV virus. The virus was detected in German greenhouses at the end of last year, after previously having been found in Israel, California and Mexico. An infection in Italy has also since been reported. The ToBRFV is a relatively new virus and is closely related to the TMV and ToMV. These types of viruses are very persistent, which is also why growers are struggling with it. In Israel, where the virus has been around for some time, growers are switching to shorter tomato crops. This way, they can limit the consequences before they become too great. The virus, which, according to the growers there, ended up in Israeli horticulture through Dutch seeds, has been spread further through soil machines. Israeli growers told us that because the soil in which cultivation takes place ensures continuous recontamination, they'll have to wait for resistant varieties. The direct impact on the market there seems to be limited. The acreage has been expanded in recent years, so the total yield has not been affected. Despite this, the prices in Israel are above average this season. Regular meetings are held in Mexico and Italy to promote the importance of hygiene in the cultivation process. "Prevention is the best defense" is the motto, and everything is put in place to make the sector act accordingly. The virus has also been found in the Netherlands, but otherwise there is still a great deal of uncertainty. Officially, the authorities have not confirmed any ToBRFV detections, although no official statement is necessary, because it has no quarantine status. Information on hygiene protocols has still been spread, also among pepper growers, for whom the virus is also a threat. Meanwhile, the NVWA doesn't know whether eradication of the virus is possible, because it is a virus that spreads easily through contact. Growers can currently only hope that they do not get infected and must try to protect themselves as efficiently as possible. Dutch importers say that the Canary tomato season has been satisfactory. The Canary season had a good start in November. The Dutch season had finished earlier and there were few import tomatoes on the market. Things went reasonably well in December, January was acceptable, February was tougher and in March things went reasonably well again. Reasonable prices are certainly expected until Easter. “The demand for large sizes was very high this year, unlike the supply. This eventually became a problem for us," says a trader from the Hamburg region. “In general, the market tends to prefer smaller sizes. This is especially noticeable in the retail. At the moment, however, the demand from the hotel and catering industry is also increasing, as the right sizes for this segment are scarcely available. "With regard to the varieties, the demand is highly dependent on the type of customer." Larger varieties are mainly purchased by catering suppliers, while smaller tomatoes are hardly sold there and end up in smaller supermarkets, or directly in the retail." Given that the Moroccan tomato season is also slowly coming to an end, prices are rising across the board. "We were unable to foresee this; otherwise, we would have stored more goods." In the German trade, Moroccan vegetables are increasingly seen as a cheap alternative to Spanish products. "The days when the Moroccan product left much to be desired in terms of quality are now far behind us," said the trader. As soon as Morocco ends, the tomatoes are imported from Spain or the Netherlands. "We have also received offers from Egypt," confirms the importer. Larger volumes of German tomatoes are also expected within a few weeks. These will also be traded from the Hamburg region by then. In Belgium, there are no known cases of companies infected with the ToBRFV virus. Precautions are being taken, but the virus is not yet perceived as a major threat. The tomato acreage is still expanding. A lot is invested in LED cultivation. Tomatoes have done reasonably well in recent times, but there is a slight pressure on prices because there is still Moroccan product on the market and large productions are on the way. French growers are at the start of the season. The prices are slightly lower than last year's, but are still satisfactory, according to a trader. The yield obtained from the harvest varies greatly per company. The prospect is that more and more specialty products will enter the French market. After last year's bad prices for on the vine tomatoes, many growers are now entering this segment. The demand for these varieties is high. According to a grower, every person in France knows at least one specialty nowadays. Another important trend on the French tomato market is the demand for pesticide-free tomatoes. The poor reputation of greenhouse tomatoes in terms of taste remains a challenge for the growers. The season for Moroccan import tomatoes is coming to an end. The plants are no longer producing large fruits, so there are many small sizes on the market. The prices oscillate between € 0.50 and € 0.70 per kilo. The Spanish export season will end in three or four weeks, as many European retailers will then switch to Dutch tomatoes. Spain currently has smaller volumes than at this same time last year. This is a result of growers planting fewer spring tomatoes in recent years due to problems with the Tuta Absoluta virus. Many growers are also switching to watermelon cultivation. There is a shortage of medium and large tomatoes and an abundance of small sizes (especially M and MM). Consequently, many Spanish retailers import beef tomatoes from the Netherlands. In general, the volumes have been somewhat smaller this year. The prices for the Marmande and Raf tomatoes have been good, and those for the plum and on the vine tomatoes have not been bad either. However, the market conditions for loose tomatoes have not been that good. This time, Spanish exporters were not affected by Turkish competition, but Morocco is exporting increasingly higher volumes of loose tomatoes to Spain and other European destinations. Spanish growers appear to be planting fewer tomatoes every year. They are switching to products such as bell peppers, zucchini or watermelons. According to one exporter, the most important reason is the increasing competition from Morocco. From January this year, the rise in the minimum wage entailed a 20-25% increase in the production costs. This makes it more difficult to make a profit from tomatoes. 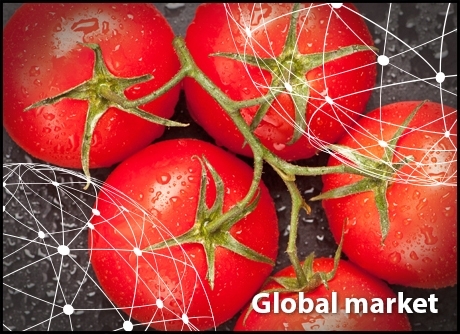 With more than 114,000 tons, the Netherlands is the most important tomato supplier for Italy. Most Italian tomatoes are exported to Germany (61,000 tons in 2018). In 2017, the acreage devoted to tomatoes intended for fresh consumption stood at 25,000 hectares (greenhouse and open ground combined). More than 70% of that acreage is in the open ground. The yield amounts to more than 1 million tons. 45% of all Italian tomatoes are grown in Sicily. An industry expert says that “the import of Moroccan tomatoes is a problem in the winter, because they drive our prices down. At the same time, more and more innovative greenhouses are being built in northern Italy, Germany and Eastern European countries. This means that fewer exports will be possible in the coming years, because consumers often prefer a local product." “The balance between supply and demand has remained fairly stable in recent weeks. Prices are around average, although this varies per product. There is already oversupply in the foreign market. In the Netherlands, for example, prices are under considerable pressure," says the tomato expert. “In order to promote the sector, companies need to focus more on quality. With the help of innovative crop protection techniques that bring pesticide residues down to a minimum, growers can deliver healthy products. To meet the demand from supermarkets, the sector must also focus on delivering products that have both a good taste and a good shelf life." A new trend in the market is the focus on specialties. The expert explains that the demand for them is on the rise, at least in Europe. Official figures show that tomato consumption is falling somewhat in terms of volume, but how this will further develop will depend on the demand for plum, cherry and colored tomatoes. “This segment is likely to continue to grow in the medium and long term. The prospects for medium products of a certain quality are also good." As revealed in the international conference of the Tomato Contact Group, there are increasing concerns about viruses. “In Sicily, growers are keeping a close eye on how and whether the ToBRFV virus is spreading. Some companies are enforcing stricter rules to protect the greenhouses from potential infections. There are major concerns in Central and Northern Europe, where the virus has already emerged (probably both in the Netherlands and in Germany). This is especially true for greenhouse tomatoes grown under lighting, where the damage appears to be huge. In the Mediterranean, it is easier to reduce the risks by resorting to short cultivation cycles. This has already yielded results in Israel, where an average of two to three short cycles are carried out." The tomato season has been very difficult. The supply in the last six weeks has been about 40% lower than at this same time last year, says a trader. Due to the weather conditions, the season came to a close earlier in some growing areas, while it started later in others. In the north of the country, the weather is currently dry. This has brought the production volumes down. In the central provinces, it rained during the harvest period and some plantations were hit by hail. The production from the Northeast and the West coast is starting to arrive and the market should be better supplied by the end of April. Prices are high, R15 (0.95 euros) - R18 (1.14 euros) per kilogram in the north of the country, slightly lower in the Cape where volumes are better. In the North, a number of important growing companies have been affected by disease, giving growers from the Cape the opportunity to sell larger volumes than usual in the North. Supermarkets have had to make an effort to find alternative suppliers. Australia has a stable production year-round for most varieties. Traditionally, tomatoes in the northern states are grown in the open ground , but in recent years, there has been a growing trend towards greenhouse cultivation. For the season that ended in 2018, Hort Innovation statistics show that 484,073 tons were harvested in Australia. This is an increase of 14%. At the same time, the value decreased by 5%, down to $ 609.9 million. Exports increased by 52% compared to the previous year and reached 804 tonnes. The value increased by 20% and amounted to $ 3 million. New Zealand was the main destination for Australian tomatoes. Meanwhile, a total of 926 tons were exported to Australia. Field-grown tomatoes had the largest market share (42%), followed by Truss (33%), cherry and grape tomatoes (22%) and Roma tomatoes (3%). Statistics NZ reports that the retail price of tomatoes in March 2019 increased to an average of NZ $ 5.20 per kilo. This is 44% higher than in February. The sector's total value is $ 131 million per year, including $ 12.24 million worth of exports. Australia and Japan are the most important destinations. According to TomatoesNZ, there are no known cases of the ToBRFV virus in Australia and New Zealand, although the sector is keeping a close eye on the situation. The virus is considered a new threat that is spreading rapidly across the various continents. New Zealand growers are requested to report any unknown plant symptoms to the MPI exotic pest and disease hotline (0800 80 99 66). North America is switching from winter cultivation to spring cultivation. The supply looks promising. “In South Florida, open ground tomatoes are still available. The harvest of spring tomatoes is starting sometime in the next ten days. This season is only short and runs until June," says a trader. At the same time, regions such as Nogalez, Arizona, are at the end of the campaign. The Mexican production continues. “The supply from Mexico is good, but not overwhelming. There are limited volumes of Roma and round tomatoes," says the trader. The Mexican greenhouse tomato season will probably last until mid-May at the latest. Meanwhile, the domestic cultivation is growing. "The harvest continues all year round, so as the days get longer, the volumes go up," says a grower. The problems on the Mexican border create challenges for importers. "We struggle to be able to import products," says an importer. "There is a delay of almost a whole day, as not enough customs officers are available to check on imported products." May 7 is an important date for the tomato sector. In mid-February, the US Department of Commerce announced a withdrawal from the Tomato Suspension Agreement. This could result in higher costs, including a 17.65% tariff for Mexican tomatoes. The demand for tomatoes in the US is good. Now that the weather is getting better, it is increasing. The prices are stable. "The supply and the demand are in good balance," says the importer. "There isn't a great difference compared to last year. The prices this year are perhaps 10-15% higher."